The traditional systems of medicine are of great relevance to the health care of the people. It is calculated that majority of world population are still relying on various traditional systems of medicine. Kerala is the first state in the country, which separate the traditional systems of medicine in to Ayurveda, sidha, Unani, Yoga & Naturopathy respectively. Comprehensives and cost effective health care through Indian Systems of Medicine. By improving quality of primary, secondary and tertiary health service delivery. Through prevention, curation promotion and protection of health of people by means of traditional systems of medicine. The department of Indian Systems of Medicine comes under Department of Ayush Kerala, headed by the secretary. The department of Indian Systems of Medicine is controlled and administered by the director. Field administration is controlled by 14 District Medical Officers. Apart from this to aid and advice the director there are Administrative Officer, Accounts Officer and Administrative assistant at the directorate. Organizational structure within the District. 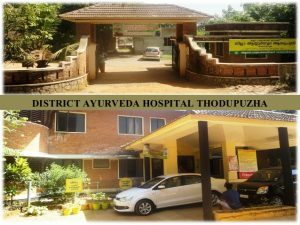 Under the District medical Office in Idukki district, Indian Systems of Department there are 67 institution situated.